The second cargo ship to head upriver today was PRINCE OF OCEAN, a wood chip carrier bringing a cargo of animal feed to Glasgow. For a ship of her age - she was built in Japan in 1991 - she is somewhat unusual as she has retained her original name throughout her career. She is 41,639 tonnes deadweight, and has an overall length of 195.0 metres. 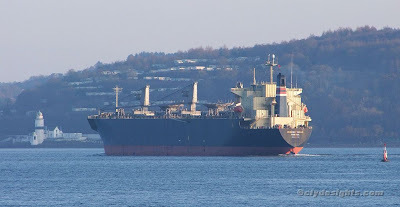 PRINCE OF OCEAN is registered in Panama, and is managed by a company based in Taiwan. The Prince of Ocean has just set off back down the Clyde. She passed the Queen Elizabeth II Hospital, Dalmuir, at 16:15. The tug Ayton Cross was ahead, but not towing. The tug Warrior III was astern and had a line aboard the Prince of Ocean. I found your site after googling Prince of Ocean when I got back from my walk. It looks interesting.